Usually around the age of 40, people begin to experience blurred near vision. Simple things such as when reading the newspaper or working at the computer are no longer so simple. Unfortunately, presbyopia affects everyone at some point. Currently an estimated 90 million people in the United States have presbyopia. People with presbyopia usually have no problems reading street signs or playing sports comfortably, but they are unable to focus on near objects such as the newspaper, telephone book, menus or other close up objects. Where farsightedness is caused by an irregularly shaped eye, presbyopia develops when the natural lens of the eye becomes less flexible. When people develop presbyopia, they start to hold books, newspapers, and other reading materials at an arm's length in order to see clearly. If they perform near work without correcting the Presbyopia they can get headaches, become dizzy or fatigued. 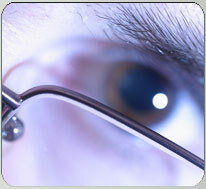 Presbyopia is caused by an age-related process. Prior to forty or so, the natural lens of the eye is soft and flexible, and readily changes shape to focus. As we age there is a gradual hardening of the natural lens in the eye. These changes occur within the proteins in the lens, making the lens harder and less flexible through the years. With less elasticity, the eye has a harder time focusing up close. Presbyopia can be corrected with bifocal or progressive multifocal glasses or contact lenses. It can also be corrected by granny style reading glasses. Because the human lens continues to change as you grow older, your presbyopic prescription will increase over time as well. You can expect your eyecare practitioner to prescribe a stronger correction for near work as you need it. Many young presbyopes dislike the granny look that reading glasses give us and so there are other viable options. Unlike bifocals which most people wear all day, reading glasses are typically worn just during close work. If you wear contact lenses, your eye doctor can prescribe reading glasses that you wear while your contacts are in. Bifocal glasses or contact lenses are the most common correction for presbyopia. Bifocal means two points of focus: the main part of the spectacle lens contains a prescription for nearsightedness or farsightedness, while the lower portion of the lens holds the stronger near prescription for close work. Multifocal lenses are similar to bifocal lenses, but they have a gradual visual change between the near and distance prescriptions. Otherwise known as progressive lenses, multifocal lenses offer crisp clear distance vision with natural appearing near vision. The natural lens of the eye hardens with age, causing focusing problems when you look up close. The result is blurred near vision.